Another remix opportunity for you... or just a chance to hear the individual elements that make up that uppity genre of music known as Afrobeat. As part of the outreach of the Fela! 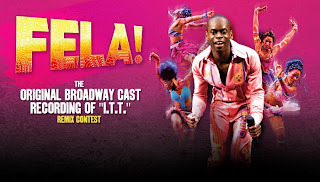 Broadway musical, Indaba Music is offering 10 individual tracks to the Fela song "I.T.T. (International Thief Thief)" for your remixing pleasure. They do wish to harvest your email in exchange for the downloads, but then you have the tracks you need to remix the autumn Afrobeat hit of 2010. You'll notice that the lyrics have been updated; I'm pretty sure Fela himself wasn't singing about Haliburton and AIG, the I.T.T.s of our day. The prizes are modest: grand prize is an Apple iPad and a slew of Fela paraphernalia, but you're doing this remix for the love of it anyway, right? Official Fela remix contest link. Get your submission in by Oct. 28 to be eligible for the prizes, or just remix it for your own pleasure. As of this writing, there are already eight entries posted, which you can hear here. If you're not a remixer yourself, you can enjoy the submissions and vote for your favorite. My fave of those posted so far? The version by remixer Mista Bright. Check it out. And as a little bonus Fela, check out the track Zombie, from the third batch of re-releases from Knitting Factory Records.